The textiles fine art night class is split into 2 semesters. The textiles fine art night class is split into 2 semesters. In the first semester the student will be studying the art and techniques of fibre manipulation. 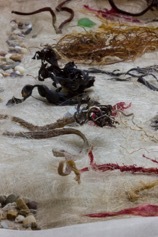 The fibres used will be wool, flax, silk, and soya bean fibre amongst others. The student will learn how to manipulate the fibre to make felt which will include nuno felting (felting on fabric), needle felting and 3d manipulation. They will also learn the art of paper making with paper and silk fibres. They will be encouraged to experiment and create their own original art pieces. In the second semester the student will be learning how to use dyes and paints and will be studying various forms of printing which will include mono printing, transfer printing, jelly printing and silk screen printing they will also learn dye techniques batik and shibori. Throughout both semesters there will be an emphasis on stitch machine and hand stitching which can be used to embellish the work. Caroline studied Textile design at West Surrey College of Art and Design in Farnham Surrey . Upon leaving college Caroline’s prints were commissioned by fashion designer Scott Crolla who exhibited them in his shop CROLLAS, the same prints were also exhibited at the Barbican Centre and the Royal Institute of architects London, her designs were also taken to America where they were exhibited by a textile agent. Later Caroline taught in Camden London for Charity C.A.S.T. and upon moving to Ireland at the Crawford College of Art and Design where she teaches first years in the fine art department and also on the new Applied Arts programme ,among the techniques she teaches are fibre manipulation, dye technology 3d construction ,stitch, hand and machine and printmaking. Caroline also teaches Combined Materials at Kinsale College of Further Education. Caroline has exhibited her work throughout Cork and has also had work exhibited in Dublin and Sligo where her work was chosen for the competition Iontas.